Paige West, Claire Tow Professor of Anthropology (Columbia), and J.C. Salyer, Staff Attorney for the Arab-American Family Support Center and Term Assistant Professor of Practice in Sociology (Barnard), were interviewed for a blog by the Center for Energy and Environmental Research in the Human Sciences at Rice University. West and Salyer, co-directors of CSSD’s Pacific Climate Circuits working group, discussed how the controversy around Australia’s forced internment of migrants and refugees in detention centers in PNG belies a deeply inequitable, neo-colonial relationship between the two sovereign nations. They also discussed how the different causes of migration (war, economy, climate change) are often blurred and how the detention centers in PNG should be viewed as an experimental venture that reveals how states like Australia intend to handle the increasing future flows of refugees. 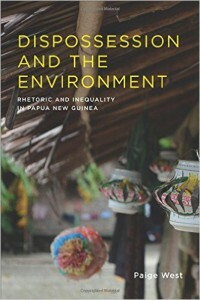 West also discussed her latest book, Dispossession and the Environment: Rhetoric and Inequality in Papua New Guinea, which explores how rhetoric of Papua New Guinea’s (PNG) alleged “savagery” operates as a mode of dispossession in domains like tourism, conservation and resource extraction.